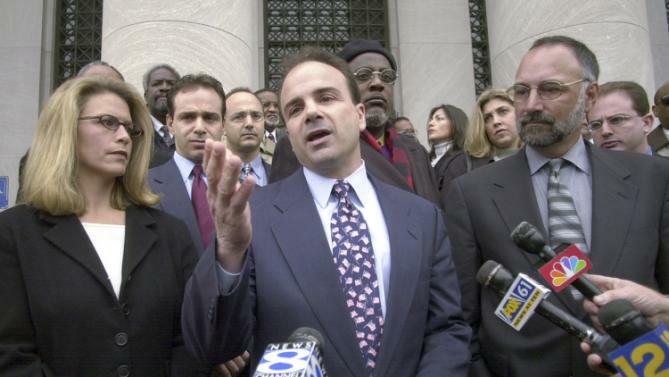 BRIDGEPORT, Conn. — For months, Joseph P. Ganim asked residents of Connecticut’s largest city to give him a second chance as mayor. On Tuesday, they answered with a resounding yes, electing Mr. Ganim, a Democrat, once again to lead the city he was convicted of betraying a dozen years ago. Mr. Ganim, 56, claimed victory on Tuesday night, citing numbers that had him beating his closest opponent, Mary-Jane Foster, vice president of the University of Bridgeport, by a vote of about two to one, with Councilman Enrique Torres, a Republican, in third place, according to unofficial results. 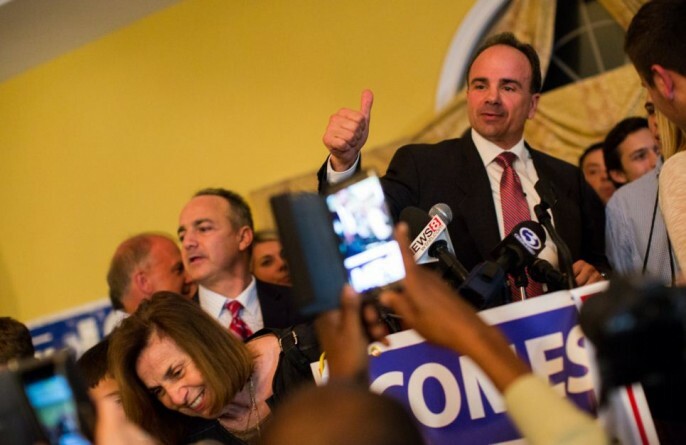 Mr. Ganim’s victory is a stunning return to public office. He was mayor from 1991 to 2003, resigning after he was convicted of accepting hundreds of thousands of dollars from people and companies doing business with the city. He spent seven years in federal prison. He added: “Taxes are too high, crime is out of control. The people of Bridgeport need jobs,” as supporters roared in agreement. From the outside, Mr. Ganim’s run was remarkable for its sheer audacity, coming after a widely publicized fall from grace. His comeback has been compared to those of Marion S. Barry Jr. in Washington and Vincent A. Cianci Jr. in Providence R.I., who both won re-election as mayor after criminal convictions. Located on Connecticut’s coast, Bridgeport has about 145,000 residents. Its unemployment rate is significantly higher than the state average. Rising taxes, crime and jobs were the concerns voters raised most often during the campaign, with taxes topping the list. Although the Bridgeport ballot listed seven candidates for mayor, the biggest competition after the primary was between Mr. Ganim and Ms. Foster. Ms. Foster, a Democrat, ran in the general election as an unaffiliated candidate who earned a slot on the ballot by petition. The Democratic city has become even more so in the last decade. Of Bridgeport’s 60,000 voters, only about 3,500 are registered Republicans, according to the state elections office. During the campaign, Mr. Ganim promised to reduce the tax burden on residents and add officers to the police force. He told voters that he pulled the city from bankruptcy and “held the line” on taxes as mayor. Ms. Foster promoted her business experience and pledged to “move the city forward” by attracting jobs and companies to Bridgeport. She also vowed to fully fund the city’s schools, sweep corruption from City Hall and emphasize community policing. Mr. Torres, 56, said he would cut taxes, train city employees in fiscal management and make the government more transparent. He also promised to focus on education and economic development, making Bridgeport a hub for jobs. Mr. Ganim’s return to public life made for a colorful mayoral campaign. A documentary team trailed the candidates. He sought to reassure voters that he would abide by the law this time around, even persuading an agent with the Federal Bureau of Investigation who helped send him to prison in 2003 to support his campaign. Mr. Ganim was also endorsed by the police union. In September, a record number of voters turned out for the Democratic primary. Mr. Ganim’s 400-vote victory over the incumbent mayor, Bill Finch, sent shock waves through the state’s Democratic Party. Ms. Foster finished a distant third. In the days after Ms. Foster and Mr. Finch lost their party’s nomination to Mr. Ganim, Mr. Finch vowed to run in the general election as a minor-party candidate. She decided to abandon her own general election run. But the race was turned upside down when news broke that Mr. Finch’s campaign had missed a key filing deadline with the state elections office. He was out of the running. A week later, Ms. Foster jumped back in the race, this time with Mr. Finch’s endorsement. Mr. Ganim and his wife, Jennifer, divorced last year. They have three children, two of whom are in college. Their youngest child, Rob, 14, campaigned with Mr. Ganim and introduced his father to supporters on Tuesday night.